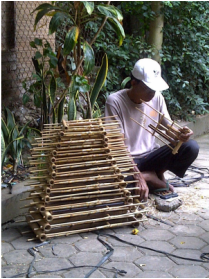 There are many steps to make an Angklung, e.g. choosing the bamboo, making the parts, tuning , finishing, and maintenance. The specific steps will be explained on next following section. The first step is choosing and preparing the bamboo. It is chosen by its age. It has to be at least 4 years old and not more than 6 years old. It is cut in the dry season, between 9 a.m. and 3 p.m. After being cut at its base, to a length about 2-3 times width of a hand, it should be stored for about 1 week, so that the bamboo will contain less water. After a week, the bamboo should be separated from its branches. It should be cut into certain various sizes. Then, it should be stored for about one year to protect it from termites. Such as by sinking the bamboo beneath mud field, pool or river, by smoking it in a fireplace, or by the modern procedure: using formula. The most important part of an Angklung, is the voice tubes which produce tone. Tuning process, which is the third step, makes the intonation. Supports the voice tubes to stand inside the hollow space. It functions as the frame of the voice tubes. The process of shaping the bamboo to become laths of voice tube. The process of blowing the lower part of an Angklung to the floor and measuring it to the tuner. The process of tuning the voice by increasing and decreasing the tone by striking voice. This process includes increasing the tone by cutting its upper parts slightly, and decreasing the tone by shaping both voice laths with shaping knife. The last step is finishing and maintenance. At this step, after each of the voice tubes produces a tone, it would be put into the frame laths and be tied of rattan rope. While during the maintenance process each Angklung is checked to make sure it is has the right tone. If it is out of tone, the Angklung must be re-tuned. Here some steps to re-tuned the angklung. If the tone of an Angklung is higher than the normal tone, the Angklung (side A) would be whittled by knife little by little until it reaches the tone wished. If the tone of an Angklung is lower than the normal tone, the end of Angklung (side B) would be cut until it reaches the normal tone.